The Colombian has always been the kind of driver who makes things happen. He won the CART championship in his rookie year, became the first “crossover” driver to appear at the Indy 500 the following year, dominating en route to victory in his first appearance at the Brickyard. Say what you will about lost opportunities during the sometimes stormy tenure during his Formula One stint with the teams of Frank Williams and Ron Dennis, which both effectively cut him loose from contracts early. Montoya often helped stir the drink in the Schumacher era and turned in some extraordinary performances in winning at circuits like Monaco and Monza. In NASCAR, give Montoya credit for becoming one of the good ol’ stars by maintaining a relatively even keel over the course of his first three seasons inside the car and out. Inside the car, he no longer tends to “retire early” when things don’t go his way. In his duel with Mark Martin at New Hampshire, Montoya also demonstrated he knows the rules of the road when it comes to keeping the show rolling instead of starting a demolition derby. He doesn’t always directly answer questions posed by the media, but Montoya generally provides interesting responses without being argumentative, short-tempered, evasive or arrogant, all present from time to time in the pre-NASCAR years. At Kansas, after working to balance his Target Chevrolet all day with air pressure and track bar adjustments, Montoya tagged Jimmie Johnson’s car and damaged his front spoiler during a late-race duel. He fulminated for two slow laps, but then re-focused and finished fourth after some encouragement from crew chief Brian Pattie. At Indianapolis, where he was infamously tagged with a speeding ticket on the pit road for, well, speeding, he re-focused on finishing the race he had dominated to sustain his place in the Chase. But the stirring may begin anew any day now. After three straight top five finishes in the first rounds of the Chase, Montoya is en route to possibly winning the championship without winning a race. If the EGR team, Pattie and Montoya keep this up, the driver may become the poster boy of all those who don’t like the re-set of points at the outset of the Chase. Tony Stewart chafes when asked about suffering from the re-set after two lousy performances in the Chase. Montoya could well become less than princely on the subject should he continue to be a contender by top-fiving all the way to the final title race in Homestead. Such questions can be perceived as slighting the driver’s ability. Thus far, it’s been all praise for Montoya — and justly so. Can it happen – a winless champion? It’s far less likely now that Stewart won in Kansas and moved up to fourth place. It’s hard to imagine Stewart, points leader Mark Martin and second-placed Johnson all failing to win races and record consistent finishes in the Top Five in the remaining seven races. That would be enough to keep Montoya, presently in third, away from the trophy. It’s more likely that Montoya himself steps up to victory lane. He has been in the hunt for two of the first three races in the Chase on tracks where he didn’t have strong records previously. If he continues to get to the front each weekend, sooner or later he and Pattie will find the right combination at the right time. If so, Montoya will be making things happen once again. Like his improbable fuel mileage victory at the Infineon Raceway, who would have anticipated Montoya winning on an oval with the Sprint Cup on the line? Few are discounting the possibility these days. This week’s edition comes from the transcript of the Friday media conference with Juan Pablo Montoya at the Kansas Speedway. Question: What are your thoughts on the race in California next week and it being added to the Chase? Montoya: “I would rather have Atlanta to be honest. I always run really well at Atlanta. At the same time we ran pretty good (in California) last time we were there. It was very early in the season and even then I think we had decent cars. Right now we’ve got much more competitive cars. Going to California it’s going to be exciting. Question: Can you talk about any instance recently where you’ve seen the team step up? Montoya: “I think everybody is just more relaxed. I think that’s the bigger thing. Everybody is calm and everybody knows what they’ve got to do. Being realistic, our goal was really making the Chase and there was a lot of pressure on everybody to do that and we did. Of course you want to run well, of course you want to fight for the championship but this is a bonus for us right now. Question: Is it going to take Top Five’s to win the Chase? Question: Some drivers at Chase time, get very into their heads and (ask themselves) what do I have to do to win? For some, the toughness of it can break them. You seem to be a little more (cavalier). After “Sliced Bread” Joey Logano made Kyle Busch look like toast (yet again) to win in the late stages of the Nationwide Series race at Kansas, the 19-year-old said he needed to get into victory lane so people would stop asking him if he was OK after his multi-roll crash at Dover the week before. …Jeez, is it that easy for the kid? …At this rate, by time he’s 24 Logano may surpass Busch’s current total of NASCAR victories in the major touring series. There must be something about the pit lane at F-1’s night race in Singapore. It could influence the outcome of the world championship once again. Having thoroughly spanked the field at Suzuka on Sunday, Sebastian Vettel and the Renault-powered Red Bull team are very much in the hunt for the driver’s title versus Brawn GP’s Jenson Button and Rubins Barrichello. If he falls short, Vettel’s pit lane speed limit violation at Singapore will loom large, just as Felipe Massa’s pit road mishap last year cost him. This year, Vettel contrived to run a shorter distance between two points in the pit lane by cutting across one corner of it. That would make him faster, right? Faster than the pit lane speed limit it turns out. The ensuing penalty dropped him from second to fourth place. …It’s an average, folks, not the actual speed of the car when point-to-point checks are used. 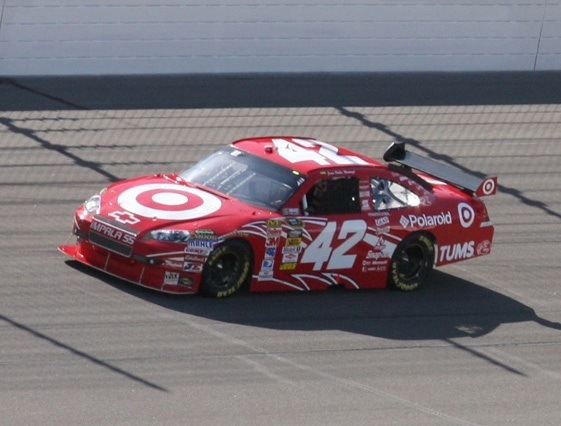 …The green light on Juan Pablo Montoya’s tachometer may have been on when he was caught speeding by NASCAR at Indy, but evidently he missed (or forgot to tell us about) the brief moment entering the pits when the red lights told him he was over the limit. Montoya, too, failed the average speed test. In other annals of race car driver tunnel vision, Felipe Massa says the “crash-gate” incident at Singapore last year cost him a championship. Even though it’s a year later, says Massa, the race should be annulled due to the deliberate crash by Nelson Piquet Jr. This would also annul Massa’s own disastrous pit stop mistake, oddly enough, the same one that opened the door for eventual champion Lewis Hamilton to gain points on him. …Yes to striking Renault’s victory that resulted from its own driver’s deliberate crash. One would have thought a USF1 test mule would have been on track by now in anticipation of the return of an American entrant to Formula One. Not a car in sight, much less drivers named. Let’s hear it for computer simulations and scale model wind tunnel testing. …At present, the Charlotte-based USF1 team’s engines appear to be Cosworth, unless the team jumps to Toyota by swapping places with Williams Grand Prix Engineering, which is leaving the Japanese manufacturer. … Hmmm. By “giving” Williams its place at Cosworth, the USF1 team could be making money before ever starting a race! One of the highlights of the weekend was watching Smoke explain to the press how the Sprint Cup champion is determined – priceless.